The rooftop air conditioners used on motorhomes are made to give many years of dependable cooling efficiency, especially if you maintain them. This article has two parts: first, how to troubleshoot your AC and decide which parts to replace or service; and second, how to maintain your AC. These repair and maintenance tips are very simple to follow, even for those without much hands-on experience. If you are unfamiliar with how a motorhome air conditioning system works, this companion article will help you understand which parts of the motorhome rooftop air conditioner unit to check, service, and repair. Briefly, your air conditioner, which may be combined with a heating system, includes a compressor—to circulate a cooling fluid like Freon through the coils and fins of the condenser—and a fan, to blow cooled air through the RV. The fan and compressor are turned on and off by a thermostat—a switch attached to a thermometer—and kick-started by one or more capacitors. The thermostat and other controls are run by the vehicle's 12-volt electrical system. Many problems your air conditioner might have—sluggish behavior, turning off prematurely--can be resolved by checking out the electrical system in order, going first through the possibilities that are easiest to resolve. These easier choices often solve the problem. If they don't, you can investigate further so you can decide if you need to replace the big items like the fan and the compressor or get a whole new AC unit. First, we'll address the common electrical issues. Before attempting any maintenance or repairs on the rooftop AC unit, be sure to switch off the electrical supply to the unit, either by tripping the breaker or by unplugging the motorhome from the electrical receptacle. If your AC does nothing and makes no noise, make sure your unit and its controls are getting power. If your AC fan or compressor is slow to start, doesn't blow any air, blows weakly, blows only warm air, stops after a while, dims your lights, or trips your breaker, you should first check your capacitors and replace them if needed. If there's no air blowing, check the fan capacitor; if there's no cooling, check the compressor capacitor. If the capacitor is okay, you should look at whether the thermostat is getting power by checking whether the 12-volt appliaces work. You can check the function of the thermostat if it's wall-mounted. If the unit only works when thermostat wires are touching, the thermostat is bad. The thermostat is easy to replace. If the capacitor and thermostat are okay, the control board may be bad. If the control board is okay, you may have to replace the fan motor or the compressor. If the fan only works at certain speeds, the fan motor may be bad. You can have the fan motor rebuilt (if it's not the sleeved-bearing type). Or you can replace the fan motor yourself if the unit is in good shape otherwise. If the compressor is bad, it should probably be replaced, not fixed. 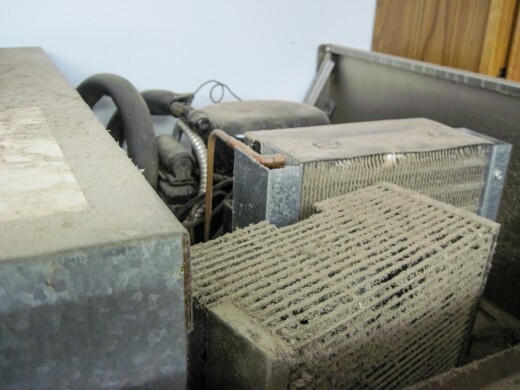 If your system drips or overheats, the coils may need cleaning. If the roof AC leaks, the bolts may be loose or the gasket may be leaking. If the system is very cold or ice builds up, it may be low on Freon. If the unit is noisy, something out of place may be interfering with its motors; you can check by removing the shroud. The First Step: Is There Power? If your unit does not react at all—does not go on and does not make noise—you will want to make sure it is getting power. Look in the 12-volt panel and check that the fuse has not blown or the breaker has not tripped. The 12-volt power system runs the controls to the AC including the thermostat. Running the AC unit itself draws a lot of higher-voltage power, maybe too much for a 15-amp power pole, and if there are two modern rooftop units they may draw too much for the 30-amp power supply provided at many campgrounds. If the unit draws more than the system can provide, the breaker or fuse will shut off. 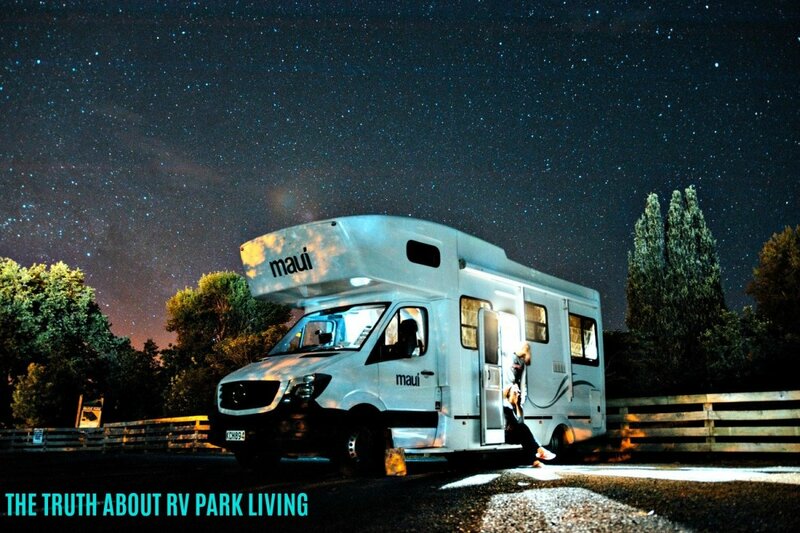 Fortunately, many campgrounds and RV parks now provide 50-amp service for modern multi-unit AC systems. The thermostat is run by 12-volt power, like your motor home's lights and vent fans. If these accessories aren't working either, there is something wrong with the 12-volt power. A breaker may be bad or there may be a loose connection in the breaker box. Occasionally the power converter that converts your higher-voltage power to 12-volt power is bad. If the fan or the compressor fail to start, it is possible the starting capacitor is malfunctioning. A bad capacitor can cause a variety of symptoms: the AC unit merely hums and "tries" to start, it runs a few minutes then trips a breaker, the fan won't start without a push, or it blows only hot air because the compressor can't start. 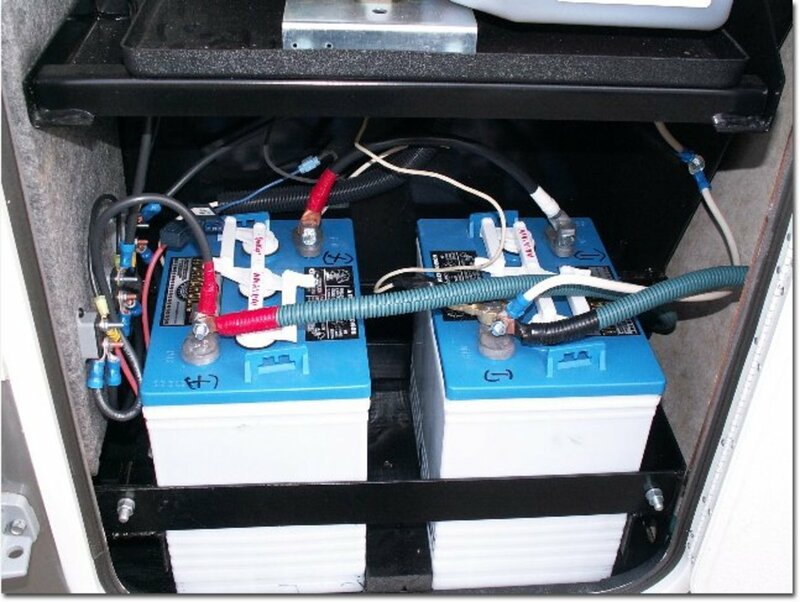 The capacitor stores electricity to give both the fan motor and the compressor an extra boost whenever the RV AC unit starts. 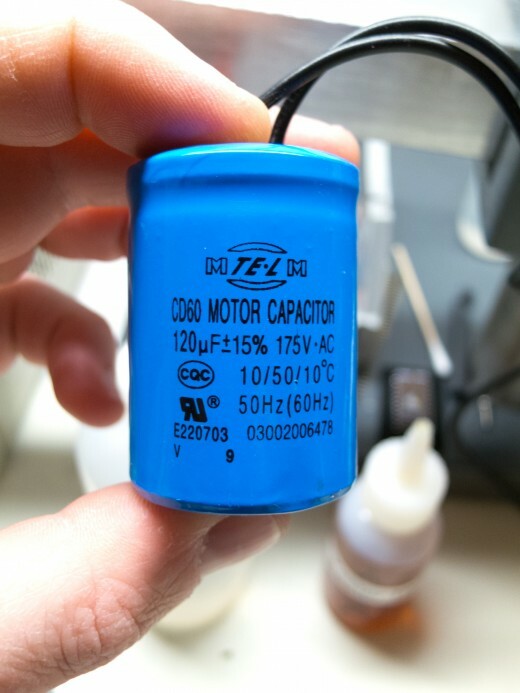 It is not unusual for the capacitor to go bad, especially if the RV sits unused for a while, and not be able to provide that little push that gets the motors going. On occasion a bad capacitor will explode with a puff of smoke without damaging the rest of the unit. There may be one capacitor for both compressor and fan, two capacitors (one for each part), or even three or more all together. A capacitor is often shaped like a small battery, flask, or button. If you have a multimeter in your tool kit, you can use it to test the capacitor. A good capacitor should show a random value on the multimeter that slowly decreases the longer you keep the probes in place. A bad capacitor is easy to replace. Check the required voltage and model numbers on the old capacitor when ordering a new one. When replacing it, make sure the power is off. Observe which wires go into it where, and make a note so you can install the new one exactly the same way. Don't touch its terminals with your bare hands. Before you throw the old capacitor away, drain out its electrical charge by connecting its terminals with a screwdriver (make sure the screwdriver handle you are holding is insulated). Very often, your AC unit will start and run fine after you replace a capacitor. A bad thermostat is another possibility. If you have a wall-mounted thermostat, you can check it by checking its voltage with your multimeter. If the unit only goes on when you touch the thermostat wires to each other, the thermostat is definitely bad. If the thermostat and capacitors are all okay but the AC still doesn't work, you may have a bad control board. Thermostats and switches may be purchased online by finding the correct model and serial numbers before ordering the new parts. These items are easy to replace in most cases. As always, make note of and remember the wiring connections when replacing these electrical components. Is Your Fan or Your Compressor Bad? If after you check these electrical items your AC still doesn't blow out air, or it blows only at certain speeds, your fan motor may be bad. If your AC blows but only hot air comes out, your compressor may be bad. Sometimes—not necessarily—a fan or compressor smokes or leaks oil when it goes bad. A compressor that is working should turn on audibly and feel warm to the touch. You can test a compressor with a clamp-on ammeter, if you can rent or borrow one. Check how many amps the compressor is drawing. 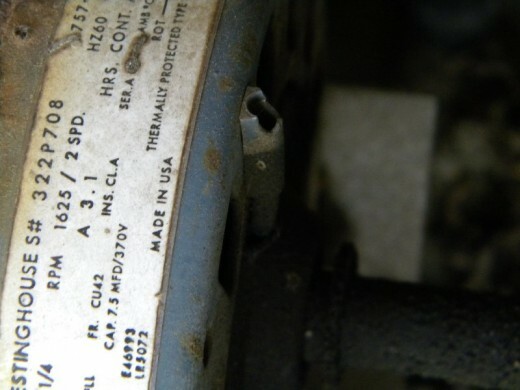 If it draws much more current than the amp rating written on the unit or on a nearby plate, the compressor is toast. Oiling your fan motor, as shown in Part 2 of this article below, will help it run more easily. If your AC fan motor is slow to start even after oiling, or needs a nudge to get it going, or only runs at certain speeds, or doesn't run at all, it will need to be rebuilt or replaced. Fan motors come in two types: with exposed bearings which may be lubricated easily or with sleeved bearings (see the last photo in the article). The first type of fan motor may be rebuilt fairly cheaply and will last for many more years. But not so a sleeved-bearing AC fan motor. Unlike fan motors with bearings, a fan motor with sleeves cannot be rebuilt economically, and must be replaced with a new one if it goes bad. If your AC unit seems to be in pretty good shape otherwise, you can order a new AC fan motor to fit your particular unit. There are many sizes and models to choose from. Check the numbers on your old motor. By looking at pictures and descriptions on Amazon you may be able to identify a universal motor that will fit your unit. Replacement of the AC fan motor is a simple job requiring only a few tools. 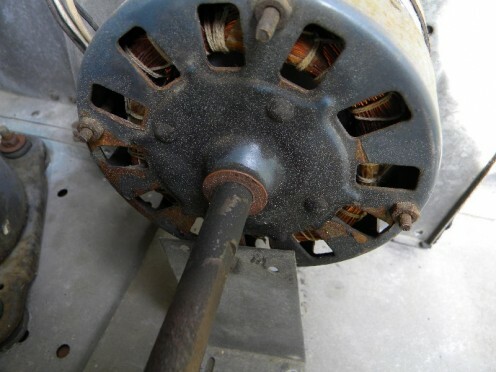 If the electrical connection to the motor isnt a simple plug-in, mark down the colors of the wires before removing the old fan motor. Test the new fan motor, before replacing the AC shroud, to check for proper alignment and fan clearance. RV AC fan motor with retaining screws removed from AC chassis. Your RV AC model may be different. 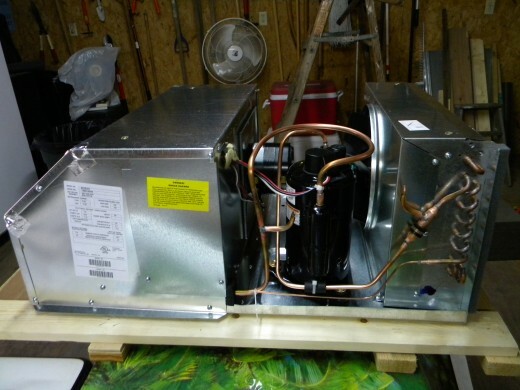 If, after you determine that the switches, capacitor, and relays are not at fault, the RV AC compressor fails to operate correctly and cool your air, it is usually better to just junk the unit and buy a new one. Unless you have access to a used compressor and have the means to replace it and recharge the system yourself, it will likely be too expensive a repair. Under normal circumstances a compressor will last much longer than its warranty. If after investigating these possibilities you decide your old RV AC unit has enough problems to need replacing, please see my article on how to install a new rooftop RV AC unit. Replacing your old unit with a more efficient RV AC unit is a very simple and quick procedure you can do yourself. If your AC does run, but only with problems—overheating, dripping, being way too cold—you can address these problems too. Overheating may be due to a simple failure to clean the coils—something I show you how to do in the second half of this article. When the coils are clean they can disperse excess heat into the air. If water leaks into your unit and seems to come from the AC, investigate to see where it is coming from. The leak may come from the gasket between the unit and the roof; if so, it's easy to address. Tighten the bolts carefully, and if that doesn't work, replace the gasket. Dripping from the unit itself may be caused by water condensing in the wrong place (in the pan under the air conditioner) instead of being evaporated by the fan. Such water buildup may be due to dirty coils, and if so, you can cure it by cleaning the coils. If your unit blows very cold and builds up ice—and especially if it later stops cooling at all—it may be low on Freon. Sometimes you can see a visible oily residue around a Freon leak. You may be able to add Freon to your system yourself with a self-piercing valve. 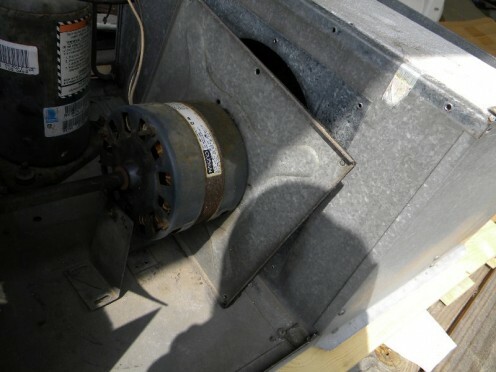 If your motor is noisy, you can investigate the problem by taking the shroud (the cover) off the roof AC unit and seeing if everything is in place. The rubber shock absorbers on the compressor and fan may be interfering with the motion of the unit. Maintenance gives your AC longer life and better efficiency. Roof air conditioning units on motorhomes are the same as ones used on other types of RV campers such as travel trailers and pop-up campers. 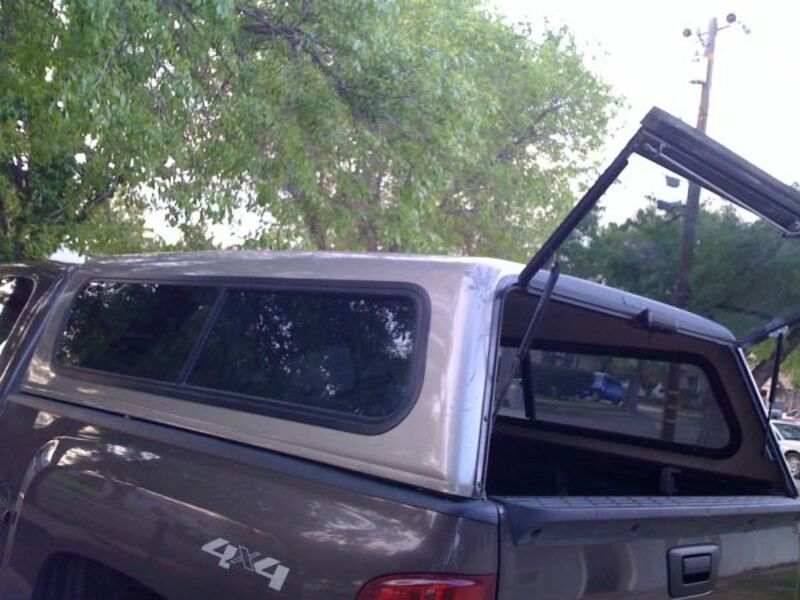 These repair and maintenance procedures are identical for all these types of campers. After a few seasons of use, it isn’t unusual for the AC unit to not cool the motorhome as quickly or as efficiently as it once did. 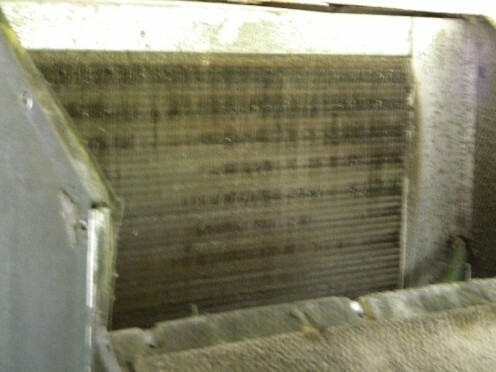 Even if you clean the filters regularly, the evaporator and condenser coils will eventually become coated with dirt and grime, which inhibits airflow and cooling efficiency. Before attempting any maintenance or repairs on the rooftop AC unit, be sure to switch off the electrical supply to the unit, either by tripping the breaker or by unplugging the motorhome from the electrical receptacle. 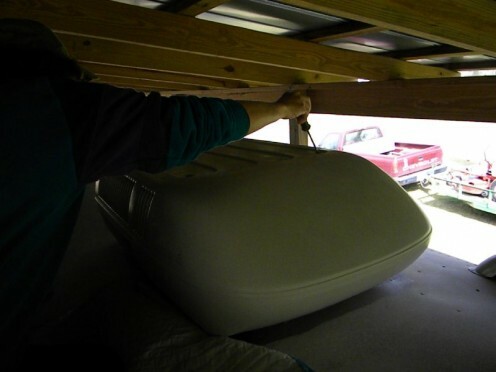 You are now ready to remove the RV AC shroud (above) by unscrewing the four bolts securing it to the RV AC unit itself. After removing the AC shroud you will be able to see the evaporator and condenser coils on either end of the RV AC unit. If they appear similar to those in the photos above then they need a thorough cleaning to allow unrestricted airflow through them. Although regular household cleaners may clean the coils to a certain extent, AC coil cleaners made especially for the purpose, like ZEP Foaming Coil Cleaner, will remove the grime build-up much more efficiently and will not harm the coils themselves. Follow the instructions carefully for the best results. A good wet/dry Shop Vac will help you clean up afterward and remove any excess cleaner or grime from the RV AC unit. Use a coil fin comb to straighten any bent fins because they too will keep the airflow from moving through the AC coils efficiently. These fin combs are very inexpensive and may be used many times in the future on both RV and home AC coil fins. Straighten out those bent coil fins and increase the efficiency of your A/C unit. RV AC fan motor with a sleeved bearing. 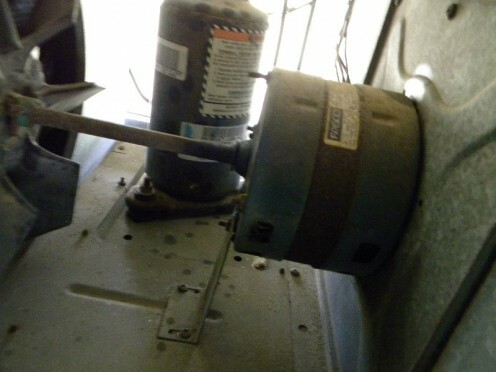 While the RV AC shroud is removed, it is a good time to service the fan motor and clean the fan itself. Whether your RV AC unit is made by Coleman, Carrier, Duotherm, or Dometic, it will have one fan motor which turns both the squirrel-cage fan and the heat exhausting fan. This motor should be oiled at this time. If your RV AC fan motor has regular bearings, there will be oiling ports at each end of the motor. It may be necessary to remove the metal sheeting over the top of the fan motor, plus a few sheet metal screws, to access the bearing oiling ports. If no oil ports are evident, then your motor has sleeves instead of bearings. You may still oil the shaft at the point where the sleeves enter the fan motor housing. The oil will seep inside and help the fan motor last much longer. Your motorhome AC unit should give you many seasons of dependable operation if serviced annually. It's good to put a cover over the AC unit during the times when the motorhome is not in use. These inexpensive RV AC covers protect the unit from moisture, extreme cold or hot temperatures, and debris from storms, birds, and insects. They will more than pay for their cost over time. Tim, this may be a weak run capacitor. Either check it yourself or take it to a local AC or electric motor repair service and they'll do it for you. I have a dou therm 59516. With the compressor on, the fan blows strong at first. Then, after awhile, it blows weak. Sometimes i can put my hand up to the vent and feel nothing. Putting it on high will cause it to start blowing again after a few minutes. But then it will loose volume again. When i just turn the fan on, this doesn't happen. Although, once when i tried to switch over to just the fan, it took a few trys to get the fan going. What are you suggestions? Paulsford, check the capacitors first of all. Jeffrey, I suggest you check the capacitor(s) first. I have a Monaco with dual a/c the rear works great but the front unit doesn’t come on. When I disconnect the control connection and reconnect I hear a click in the control box but no activity from the unit. Danny, have you looked underneath the shroud atop the roof? Paul, probably a bad capacitor. Around 20 bucks or so to replace. Any AC repair or electric motor repair service can check it for you and replace it in most cases. Or you check it yourself with a multi meter set on ohms. If you get a random decreasing number the cap is good. A steady number or a 0 means it's bad. Danny, this is probably a thermostat or control board problem. Check the stat first before ordering a new control board. Daniel, it could be either of these plus the control board. I'd check the caps first then the stat. If neither of these solve the problem, then a new control board may be in your near future. But then, there's also the fan motor to consider. A/C Turns on but only runs on Low setting.. When switched to High it only stays on low setting? Capacitors or thermostat? Melanie, first check or replace the capacitors. Ac not working in my 2018 jayco camper. Kevin, the fuse may control both the h/w heater and the A/C thermostats. What were you repairing on the heater, and are you sure the fuse didn't blow when you replaced it? A bit more info may help. Wren, the RV motor doesn't supply enough amps from it's generator to run the AC. Sorry! You have lots of great information here. Thank you. I do have a question though. Will the roof a/c only run on the generator and house/campground power?? I was thinking it would also run when the RV motor was running. Michael, unfortunately yes. A hot compressor isn't a good sign. My 13.5K not blowing cold air. Coils are clean, both caps replaced. Compressor is drawing 6.5 amps on black wire and 7.8 amps on red wire. Compressor is very hot to the touch after only 5 minutes run time. Thermostat seems to work fine. Bad compressor? DJ, this could be one several problems. It could be a capacitor and this is cheap and easily replaced. But it could also be a thermostat or control board issue. As for the icing up, sometimes this indicates a low Freon charge. Lovelyadri,, try cleaning the coils with a no-rinse spray coil cleaner you can find on Amazon or at a local ACE Hardware store. Have black mold coming into bedroom from ac. Wish i had a picture to share. How can we fix this? We are fulltime and have a bby coming soon. Clyde, you may be able to get a more powerful AC unit, but I don't know of a replacement fan which would do this. Have you considered adding another unit? If you have another vent, it will fit right in if you can run another 110 volt wire. Also, have you considered using a portable AC when in hotter climates? They are relatively inexpensive compared to a roof unit and easy to install. If you have a ducted system, be sure the ducts are open and not collapsed. In some cases you'll need to use a broom handle to see if they're collapsed or not. This can cause the fan not to circulate the air properly. Hope this info helps you out, Clyde! I have a 2017 Fleetwood Flair 31B. It has one air conditioner and does not provide ample cooling when in very hot locations. Is it possible to increase the size of the fan motor to circulate more cool air? Thanks Randy, here I found a 20 pounds regulator with protection if current go down, an industronic AMCR 5kva, hope it will do the job. Caumette, I do believe there is a surge protector which can alleviate this problem. Try Amazon under RV Surge protectors. That can be a problem to use my Coleman roof AC ( new model from 2018)? Rex, yes it could be the stat, but it could also be the control board causing this problem. Check the stat first before ordering a replacement control board. the fan runs when the thermastat is in the fan possition but when i place the thermastate in the ac position nothing happens, could this be a bad thermastat? Mark, this is usually sign of dirty coils. Some debris always gets through the filter, and over the years it clogs the interior coil. This prevents the fan from dispersing the excess moisture into the air. This accumulated moisture is what's dripping from the ceiling assembly. Either order some no-rinse coil cleaner from Amazon or go to a local ACE Hardware store if there's one nearby. A good cleaning will solve this problem. Water dripping from ac duct in the fithwheel RV,Dealer and Keystone says nothing wrong with the AC they do that.cealing and all around ac duct wet. Brent, the control board is accessed by removing the shroud atop the camper. You'll see where the major electrical connections all lead to or from the board. I cant seem to find a control "board" for the coleman mach 15k. Is the control box the same thing on the ceiling where the knobs are? Mike, remove the shroud which normally as 3 or 4 nuts holding it on. I'd try replacing the cap first, Brent. I still suspect the control board may have been damaged as it controls the fan speed as well. Would you recommend replacing both the fan and the run capacitor at this time or just fan? Thank you. No problem, Brent. I'd try a new cap first before ordering a new control board. Yes, fluctuating voltage. I dont know if it was a sag or a surge, but the TT next to us had a/c issues late evening/ overnight as well so I attributed it to something that affected us both. I could be wrong. Thank you Randy. Brent, when you say "dirty power" do you mean fluctuating voltage? If so, a cap may be damaged although it's showing as good on the ohm meter. If this isn't the problem, I suspect the control board may be damaged. Last summer we got some dirty power at a campground, as thats when our a/c trouble started. When we turn on, the fan blows high, then slow high then slow. I believe the compressor is running and cooling, but the fan speed keeps changing..then in the morning only the compressor is running, no fan going. I checked both capacitors and they appeared to check ok on the ohm meter. Where should i go from here? It has no wall thermostat, only the two roof knobs. Should i replace the fan capacitor anyway just to make sure its not that since its cheap? Or should i suspect something else? Thank you. Cynthia, hopefully it will work for awhile, but sooner or later the sleeves will get too worn to keep the fans balanced. Hi Randy- I sprayed the shafts in the air conditioner unit and it worked. The high pitched squeal stopped. Thanks so much! Gary, apparently there's a device made by the maker which uses the jack to either test the stat or synchronize it. Sorry, that's all I got! how can the thermostat be checked when it has a telephone style jack plug ? Hey Cynthua, try spraying some WD40 around the shaft where it enters the fan motor on both sides. If this stops the noise, then the sleeves--most AC fans these days do not use bearings--are probably worn. You may be able to use a heavy oil to prolong the life of the fan motor if this is indeed the case. Hope this helps you find the problem. Mark, this is strange. If the noise was continuous, then Id's suspect one of the fans had something making it out of balance, but with the noise being intermittent this is out of the question. Unless you can remove the shroud and observe the unit while it's making the noise, then I can't help you with the problem. Having an intermittent problem with the Coleman Mach heat pump on my 2013 Winnebago, periodically when the unit is running in either heat or cool mode, a loud thumping noise can be heard inside and outside the coach. Sometimes it lasts only a few minutes and goes away, other times it lasts until the a/c unit is turned off for a few minutes, and restarted where the noise doesn’t reappear sometimes for hours or days. Perplexed on where to start looking? Ken, this is either a thermostat or control board issue. Check the stat before replacing the control board. My AC unit is a Dometic. The AC unit cuts off and normally will not come back on until I turn the thermostat to off and let it stay off for about 25 seconds, then turn back on and the unit will come back on. navarreslady, try using a bleach based cleaner and see if it helps the odor. We have a 1999 Winnebago adventurer, we've noticed a mildew smell when using our back ac, I removed the shroud, and cleaned it (wasn't too dirty, the fan, motor, and fins are all clean. But I went ahead and took the metal cover off to check everything, and it looks like the mold is on the inside of the metal cover on the insulation! Any suggestions?? I'm guessing the gasket around the bottom needs replaced, but is there anyway to get the mold out of the insulation? and if not where can I find new insulation for it? Jim, the drain should be easily seen if the unit has one. Many newer ACs don't use one. Are you sure it's not simply dirty coils causing the problem? Art, this sounds lime a control board problem unless the thermostat is bad. Update on post from last week. We are up and running. The in line fuse auto reset was bad. We replaced it. Finally figured out battery black and white negative and both reds positive. EVERYTHING works. Yippie. Randy I have a Coleman Mach roof mount w ceiling controls. My issue I have the fan stop after a few moments of use, regardless of speeds. I have replaced both capacitors and even the ceiling controls. I hear the compressor kick on. sometimes the speed of the ceiling fan will fluctuate. After it fails I shut it down to off, wait a cpl mins and restart. It again will run for a few mins and fail. I have a 2010 Jayco 19ft hybrid. The unit over the years as had very light use on the AC. What else could it be? Thanks randy, good was thinking the same thing. I wanted second opinion before I spend $$$. Ribright, if you're sure the stat is operating properly then you may have an issue with the control board. Justin, assuming the fan normally cuts off when the compressor stops, the only thing left is the control board which receives the signal from the stat. Filters and condenser coils are pristine. New unit (2016). My AC blows ambient air both on AC and when heat pump is selected. I have a Dometic single area thermostat with fan, cool, furnace and heat pump as it's selections. Compressor comes on and off as it should but air temp never changes. Roof AC blower will not stop running. The unit is from 2012. It will momentarily turn off while compressor turns off and on but go back running. I’ve replaced thermostat. And it is set to auto. We may have found the problem. The fuse link at battery .we took it off to clean since it was rusted one of the posts come off and was not making contact. Taking it home to find replacement. We will keep everybody posted. 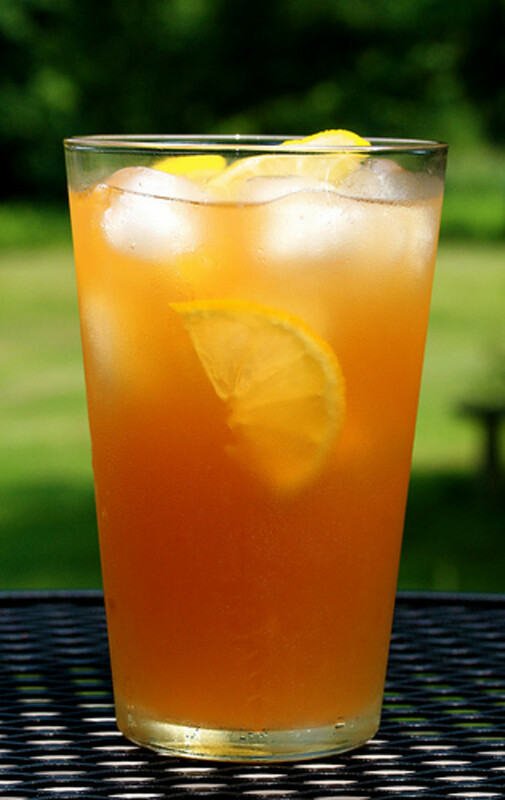 Jeramoran. first check the capacitors in the AC. You may have a weak cap causing the overload. Help! We have 29 ft travel trailer fourwinds . Ac and Refrigerator wont stay on consistently its plugged into shore line. Seems like when compressor kicks in it shuts back down. Not sure if it's a converter problem. Terri, this may be a control board issue. Try powering off again and see if the code resets. I have an E7 error code showing on my fifth wheel control panel for zone1 only. Zone 2 is working fine. We had to power off some things earlier and then back on. If anyone can make a suggestion I would appreciate it. Wayne, more than likely you have a bad door gasket if a drain isn't visible in the outer fridge access door. Matt, have all caps checked as it only takes one weak cap to cause this problem. I'm glad I found your website, thanks for all of this usefull info. I have a 2001 coleman popup with a 13,500 BTU rooftop AC, that I've never maintained. The camper has been garaged its whole life. The AC works ok and I recently bought a Champion 3400/3100 Watt generator. The gen will start the unit initially, but overloads when I dial the thermostat warm then cool. It seems both the running fan motor and starting compressor are too much. I replaced the hard start capacitor, but no change in performance. Thinking of testing the fan capacitor next, and oiling. Thoughts? Jimmy, sounds like either the thermostat or the control board is bad. The ac unit on our 2013 heartland cyclone kicks on and off and is reading the E5. Patricia, if you haven't cleaned the coils yet then you need to do so. You also need to check the capacitors as one of them may be weak or bad. The AC keeps tripping the breaker, 90% if the time at night (after 8 pm). We dont change the temp. We are work camping and we are the only tt hear. Any ideas? The coil behind the filter will get clogged over the years more so than the outside coil. This can cause the compressor to overheat because the fan cannot intake and exhaust the hot air easily. No, I haven't, Randy. The outside coils look fine, but I have not taken the metal shroud off to look at the other ones. I will try and do that in the next day or two. Roy, have you cleaned the coils yet? Randy, I just checked the capacitors with my multimeter; they all checked out fine. Now, I've noticed something about this problem: it seems like when the humidity AND the outside temps are high, the problem with this compressor shutting off and on becomes pronounced. Then, when the temps come down a bit, like at nighttime, the compressor seems to work normally. I did not replace any of the capacitors. This is not a scientific observation because the problem just began yesterday, but it seems to be yet another piece of evidence of why this might be happening. Any ideas? Roy, you can use a multimeter set on ohms to check the capacitors. When the probes are applied to the terminals you should get a random number decreasing in value if the cap is good. Otherwise, the cap is weak or bad. Randy, all of a sudden my Coleman Mach ac unit on my RV is doing something it has never done before: while the unit is running, the compressor now kicks off and on. I usually keep the unit on "Auto," and never before has the compressor acted this way. And the compressor seems to run for a few minutes, with the fan continually going, then the compressor shuts off, the fan continues, and then the compressor kicks back on. When the temperature in the RV reaches what I set it to on the thermostat, everything shuts off like it normally does. Does this sound like a capacitor problem? I just recently replaced the motor and it has been working flawlessly until just a couple of hours ago. David, I hesitate to advise you this as the control board may not be the one needed for a heat strip. Normally there would be a connector already installed if the control board was wired for it. Well Randy, I have another dilemma. I decided to invest in the optional heat strip despite all the reasons not to. Upon fitting I found that my unit didn't have the two pin connector for the strip although I do have a heat/cool thermostat. Any ideas how to wire this without the missing 'heat ready' connectors? David, pleased to hear this. Sorry I didn't have solution for you. I'll keep the solution in mind for others with a similar problem. Thanks! Figured it out, thanks Randy. the B- terminal was the -12V back to the stat. Doubled up to that connex & I'm back in business. Thanks for the reply! David, I don't have a wiring diagram for this unit. Look online at the Coleman site and there may be a diagram or someone who can help you. Sorry! Does the unit still work normally? If so it may be an extra ground for the board or other electrical component.